This very fine example of domestic architecture in Lowland Scotland dates from the 14th century and was sympathetically restored by the Lorimer family in the late 19th century. The castle contains magnificent plaster ceilings, a mural by Phoebe Anna Traquair, painted panelling and fine furniture designed by Sir Robert Lorimer. Of particular interest are the Victorian nursery and the old kitchen. The late Victorian garden features a fine collection of old-fashioned roses and herbaceous plants which are cultivated organically. 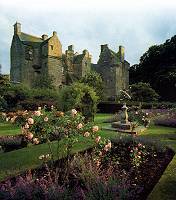 Wheelchair access to garden and ground floor of castle, wheelchair available. On B9171, 3 miles north of Pittenweem.